The Trudeau Liberals are flailing in their attempts to respond to Jagmeet Singh’s pledge to get serious about the housing crisis and build half a million affordable housing units over the next ten years. 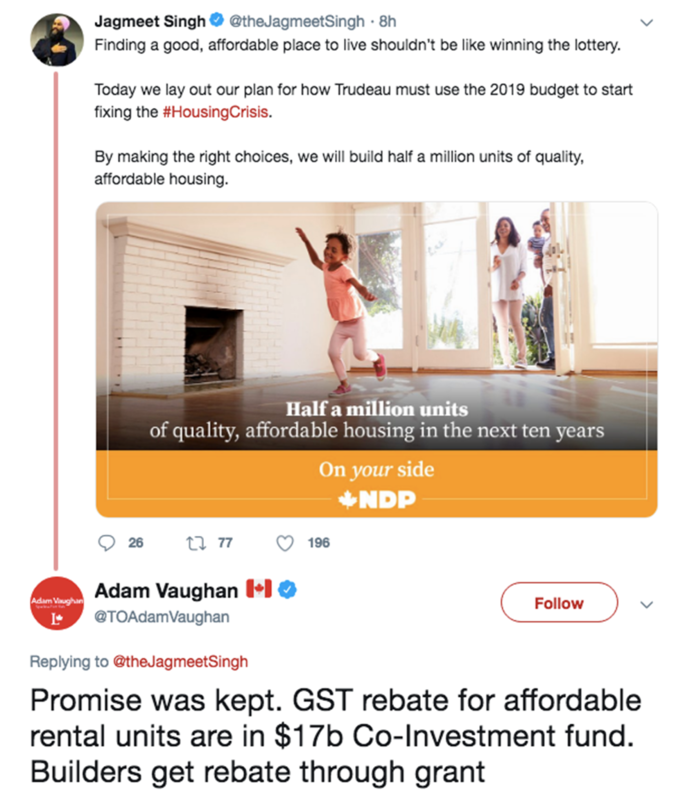 Liberal MP Adam Vaughan – that party’s go-to on housing related matters – tweeted in response that the NDP proposal to remove GST/Federal HST on the construction new affordable housing was already acted upon by his government. Apparently Vaughan can’t seem to keep track of which promises his government has kept and which ones they’ve abandoned. The government’s own website entitled, ‘Mandate Letter Tracking,’ a site designed to promote the completion of various commitments, contradicts Mr. Vaughan’s claim. Not only has the Trudeau government failed to deliver on this promise, the website states they have no intention of ever following through. Meanwhile, the Canadian Housing and Renewal Association lauded Singh’s bold proposal. While the Trudeau Liberals are desperately trying to cover up for their failure to address the housing crisis, the reality is 1 in 5 Canadians are spending half their income on rent. Mr. Vaughan’s efforts would be better spent delivering on the housing measures he was elected to implement. And with the Federal Budget just around the corner he’ll get one more chance to do exactly that. © 2018 New Democratic Party of Canada, all rights reserved.